Go to original pattern for design DROPS 74-4. 400-400-450-500-550 gr nr 43, light brown. 1-1-1-1-1 spool col. 01, gold. 300-300-350-400-400 gr nr 15, beige. DROPS 8 mm [US 11] needles and 5 mm [US 8] needles (for belt), or sizes needed to obtain correct gauge. 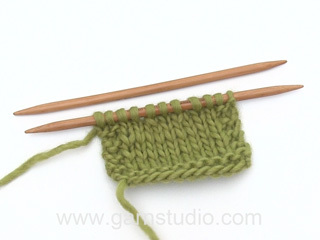 Gauge: 11.5 sts x 14 rows with 1 strand Vienna or Melody + 1 strand Glitter on larger needles in stockinette st = 10 x 10 cm. K 1 (edge st knit in garter st throughout), K 1, P 1, K 1, P 1. 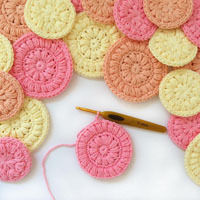 All decs are made on right side rows. After 5 sts: Slip 1 as if to knit, K 1, psso. Before 5 sts: K 2 tog. Back: Cast on 56-62-65-71-74 sts on larger needles with 1 strand Vienna or Melody + 1 strand Glitter. Knit the first row (right side row) as follows: K 1 (edge st knit in garter st throughout), K 1, * P 1, K 2 *, repeat from * - *, finish with P 1, K 1 and K 1 (edge st knit in garter st throughout). 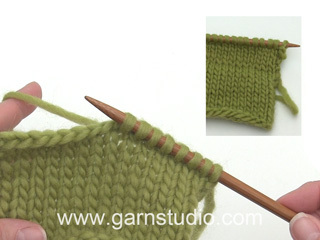 Knit rib until the piece measures 3 cm. Change to stockinette st, decreasing 1-2-1-2-1 sts evenly distributed on the first row = 55-60-64-69-73 sts. At the same time, when the piece measures 10-10-11-12-12 cm dec 1 st at each side every 3-3-3.5-6-6 cm a total of 3-3-3-2-2 times = 49-54-58-65-69 sts. When the piece measures 24-24-26-28-28 cm inc 1 st at each side every 3-3-3.5-6-6 cm a total of 3-3-3-2-2 times = 55-60-64-69-73 sts. When the piece measures 38-39-40-41-42 cm bind off for armhole at each side every other row: 3 sts 1-1-2-2-2 times, 2 sts 1-1-1-2-2 times and 1 st 1-3-2-2-3 times = 43-44-44-45-47 sts. 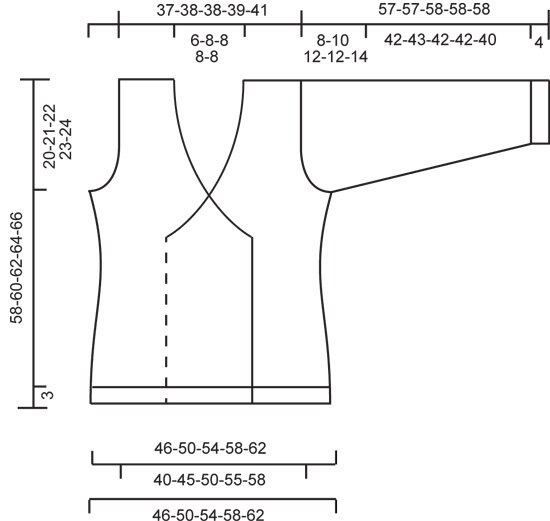 When the piece measures 54-56-58-60-62 cm inc 1 st at center back for sizes M and L = 43-45-45-45-47 sts. Then knit rib (P 1, * K 1, P 1 *) over the center 17-19-19-19-19 sts, keeping the remaining sts in stockinette st. After 2 cm rib bind off the center 7-9-9-9-9 sts for the neck = 18-18-18-18-19 sts remain on each shoulder. Continue, keeping the 5 sts at each neck edge in rib as established (but knit the edge st in garter st). Bind off when the piece measures 58-60-62-64-66 cm. Left front: Cast on 37-40-40-43-46 sts on larger needles with 1 strand Vienna + 1 strand Glitter. Knit the first row (right side row) as follows from side edge: K 1 (edge st knit in garter st throughout), K 1, * P 1, K 2 *, repeat from * - * to last 5 sts, P 1, K 1, P 1, K 1, K 1 (edge st knit in garter st throughout). Knit rib for 3 cm, then change to stockinette st, decreasing 1 st for sizes M and XXL and increasing 1 st for size L = 37-39-41-43-45 sts and keeping the 5 button band sts (center front edge) in rib. When the piece measures 10-10-11-12-12 cm dec 1 st at the side every 3-3-3.5-6-6 cm a total of 3-3-3-2-2 times = 34-36-38-41-43 sts. When the piece measures 24-24-26-28-28 cm inc 1 st at the side every 3-3-3.5-6-6 cm a total of 3-3-3-2-2 times = 37-39-41-43-45 sts. Neckband: At the same time when the piece measures 20-22-24-26-28 cm dec 1 st at the center front every 4 rows 13 times - see knitting tips. 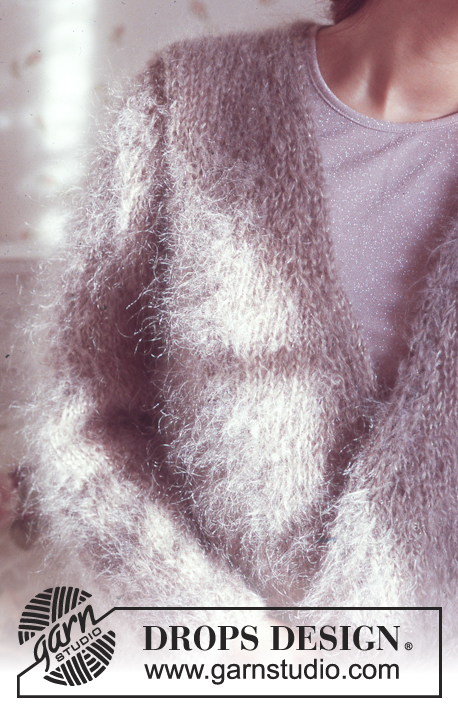 Armhole: At the same time when the piece measures 38-39-40-41-42 cm bind off for armhole at the side as on back. After all armhole and neck shaping 18-18-18-18-19 sts remain on shoulder. 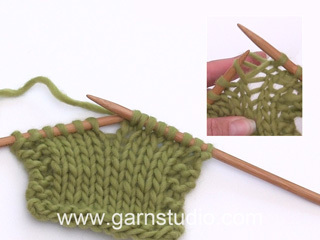 Bind off the remaining sts when the piece measures 58-60-62-64-66 cm. Right front: Knit the same as left front, reversing all shaping. Sleeve: Cast on 26-26-29-29-32 sts on larger needles with 1 strand Vienna + 2 strands Glitter. Knit the first row (right side) as follows: K 1 (edge st knit in garter st throughout), * K 1, P 2 *, repeat from * - *, finish with K 1 (edge st knit in garter st throughout). Knit rib until the piece measures 4 cm then drop Glitter and continue with Vienna only in stockinette st. When the piece measures 6 cm inc 1 st at each side every 5-4-4-3.5-3.5 cm a total of 9-10-10-11-11 times = 44-46-49-51-54 sts. When sleeve measures 49-47-46-46-44 cm bind off for sleeve cap at each side every other row: 3 sts 1 time, 2 sts 2 times, 1 st 0-1-2-2-4 times, then bind off 2 sts each side until the piece measures 57-57-58-58-58 cm. Bind off the remaining sts. Belt: Cast on 7 sts on smaller needles with 1 strand Vienna + 1 strand Glitter. 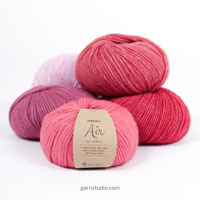 Knit as follows: K 1 (edge st knit in garter st throughout), * K 1, P 1 * twice, K 1, K 1 (edge st knit in garter st throughout). 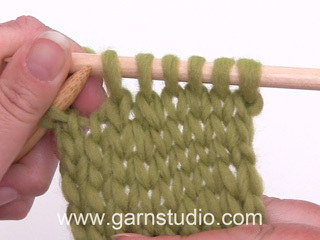 Bind off when belt measures approx. 120-150 cm. Bonjour, pour les bordures et les manches; s'agit-il de côtes 2/1 (car la vidéo proposée est pour les côtes 1/1) et si oui, faut-il conserver la maille lisière en point mousse? On aurait donc à chaque rang 1 mousse pour la lisière de chaque côtés et pour le rang envers, cela donnerait "1 mousse, 1 envers (ou 1 endroit encore? ), 1 endroit, 2 envers, 1 endroit, 2 envers,..."? Merci. Bonjour Gaïanne, les côtes du début se tricotent comme indiqué = 1 maille lisière au point mousse, 1 m env/2 m end en commençant par 1 m end (on termine par 1 m env, et 1 m end), 1 maille lisière au point mousse. On utilisera les côtes 1/1 plus tard. Bon tricot! Bonjour Gwenaël, en taille XXL, vous rabattez au début de chaque rang de chaque côté: 1 x 3 m, 2x 2 m, 4x1 m puis 2 m jusqu'à ce que la manche mesure 58 cm de hauteur totale (ce qui peut être 1 ou plusieurs fois en fonction de votre tension en hauteuur), et rabattez ensuite les mailles restantes. Bon tricot! Lees de volgende beschrijving voor u verder breit! DEZE TEKST STAAT NA HET LINKER VOORPAND MAAR OP WELK DEEL MOET MEN DIT TOEPASSEN Minder bij een hoogte van 10-10-11-12-12 cm 3-3-3-2-2 keer 1 st aan de zijkant op iedere 3-3-3,5-6-6 cm = 34-36-38-41-43 st. Meerder bij een hoogte van 24-24-26-28-28 cm 3-3-3-2-2 keer 1 st aan de zijkant op iedere 3-3-3,5-6-6 cm = 37-39-41-43-45 st.
Hallo Diane, Dit pas je toe op het linker voorpand (en ook op het rechter, maar dan in spiegelbeed), de beschrijving gaat dus gewoon verder, maar je moet eerst alles even doorlezen voordat je verder gaat, omdat je om verschillende plekken in op het pand tegelijkertijd moet minderen. Hei! Nyt ohjelinkistä löytyy oikea ohje. Hei Anecke. Se maalskitsen nederst paa mönstret. her kan du se maal per str i cm. Du kan vurdere om den er stor nok til graviditetstöj. Vi har ikke specifikt graviditetstrik, men en del vide og store modeller som du sikkert godt kan have en gravid mave i.